The southern Baranya was initially called “Swabian Turkey”. During the interwar time, this name comprised the region between Danube, Drava and Balaton. Between 1683 and 1697, the Imperial troops and their allies had pushed the Ottoman army back as far as the Balkan. The newly conquered territories thus came into the possession of their former owners or new ones. The Diocese of Pécs was given land by the Imperial Court as well. The new landowners had to look for subjects and successfully recruited migrants. However, those were not enough and after the new settlements had been destroyed during the Rákószi Fights (1703-1711), an organised settlement of German families was begun and continued throughout the 18th century. The migrants from Hesse, Franconia, Bavaria, Württemberg, Swabia and Pfalz were settled on state-, private- and churchly ground. The newly founded villages were only German-speaking. 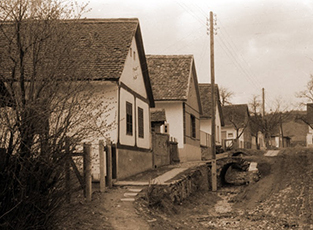 However, Germans were also settled in Croatian, Hungarian and Serbian villages, which were multilingual. In most of them, the “Swabians” came to be the majority. Catholic and protestant Germans usually lived in separate villages. Pécs was always the biggest city of the region and attracted many migrants from Austria (Vienna, Styria and Carinthia). 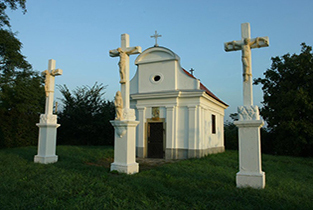 The German-speaking citizens lived among Hungarians and Croatians and had a common denominator in their Catholic faith, since the bishop – as the landowner – only let Catholic settlers into the city. This strict rule only loosened after 1840 when some Jews and Protestants came to Pécs as well. Until the end of the nineteenth century, most of the Germans assimilated, lost their German identity and abandoned institutions such as schools and theatres. In the villages, however, the German population maintained their language, traditions and rural lifestyle until after World War II. From 1945 onwards, the collective dispossession, the deportation to Russia and the displacement of Germans of Hungary destroyed almost all settlements. This tragic inheritance still shows its effects until today. Those German communities still in existence hope to maintain their independence as an ethnic group by consciously cultivating their traditions. Whether these efforts will be successful, only time can tell. 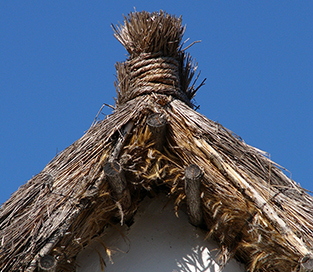 The thatched roof on the local history museum of Ófalu is one of the last remaining examples of this – formerly very common – kind of roof coverage.